Megapomponia merula (Distant, 1905) used to be know as Pomponia merula. Why did its genus change? Mega refers to the very large size of these cicadas. Michel Boulard created the Megapomponia Boulard, 2005 genus. Pomponia still exists (but those cicadas are smaller). 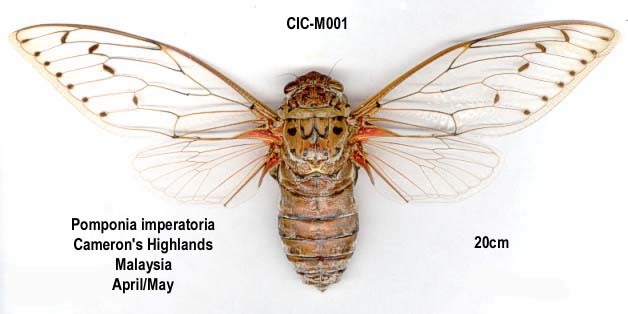 This cicada is found in Malaysia and Indonesia. The image says Pomponia merula, but the newest name of this cicada is Megapomponia merula. Characters. — Head (including eyes) about as wide as base of mesonotum, its length about or nearly equal to space between eyes, ocelli much farther apart from eyes than from each other, front anteriorly convex and slightly prominent; pronotum with the lateral margins moderately ampliate and sinuate, the posterior angles dilated, a little shorter than mesonotum; mesonotum with the disk moderately convex; abdomen in male longer than space between apex of head and base of cruciform elevation; tympanal coverings complete; opercula in male short and transverse ; rostrum passing posterior coxae; anterior femora spined beneath; tegmina and wings hyaline, the first usually more or less maculate, basal cell longer than broad, apical areas eight.